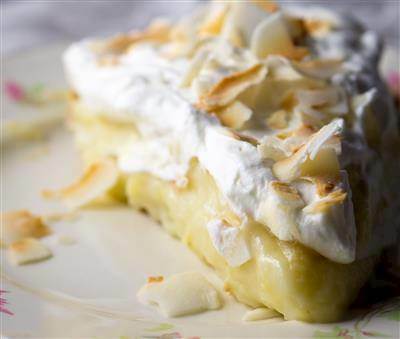 This scrumptious coconut cream pie is a cinch to make with a store-bought crust. While the crust bakes for a few minutes in the oven, prepare the coconut custard. After the crust cools, fill it with the custard and sprinkle it liberally with toasted coconut flakes. RecipeSavants.com This scrumptious coconut cream pie is a cinch to make with a store-bought crust. While the crust bakes for a few minutes in the oven, prepare the coconut custard. After the crust cools, fill it with the custard and sprinkle it liberally with toasted coconut flakes. Smart Recipes, American Recipes, Eggs,Dairy Recipes, Recipes Eggs,Dairy American Coconut Cream Pie PT25M Serves 8 Ingredients: 0.75 Cup Sugar 3 Tablespoons All-Purpose Flour 0.125 Teaspoon Salt 3 Cups Whole Milk 3 Large Eggs 1.5 Cups Sweetened Shredded Coconut 1 Tablespoon Butter 1.5 Teaspoon Vanilla Extract 1 Store Bought 9-Inch Pastry Shell In a saucepan, combine together the flour, sugar, salt, and milk over medium-high heat and cook until thickened, stirring continuously. Reduce the heat and cook for another 2 minutes, stirring continuously. Remove from the heat, and set aside. In a bowl, add eggs and beat well. Slowly, add about 1 cup of the hot milk mixture and stir to combine. Combine the egg and milk mixture, and remaining milk and gently bring to a boil, stirring often. Reduce to a simmer, and continue to cook for another 2 minutes, stirring continuously. Remove from the heat and stir in butter, 1 cup of the sweetened coconut, and vanilla extract. Transfer the mixture to the prepared pie shell and top with remaining sweetened coconut evenly. Chill for several hours before serving.